There is a very popular ongoing Norwegian petition to give Finland a mountaintop for the 100th anniversary of its independence (6 December 2017), by moving the border a short distance. The barren northern rock is of no particular interest to Norway, but to Finland it would be a new highest peak. I find this improbable but fascinating. When has a sovereign state most recently organised a voluntary and friendly concession? Voluntarily merging the entire country with another doesn't count. Both must exist independently afterward for it to have been a gift! The UK transferred full sovereignty of its colony of Hong Kong to the People's Republic of China on July 1, 1997. While the UK was already obligated by treaty to turn over the areas of the territory that was covered by the 99-year lease (the "New Territories"), it decided to return the island of Hong Kong itself as well as Kowloon, which was voluntary at least in the sense that no treaty required it. One could make an argument that the transfer was influenced by political pressure from the PRC and the possibility of an invasion, but there was no actual violence. As @Relaxed and @TheHonRose mentioned, the UK also realized that the New Territories were essential to the survival of the colony and that a new, smaller colony consisting only of the island of Hong Kong proper plus Kowloon would not have been viable. There were population issues (are they all going to move across the border overnight?) as well as issues with essential infrastructure like ports being located in the New Territories. The Tiran and Sanafir islands, are being given by Egypt to Saudi Arabia. Since this is ongoing, it is certainly the most recent such transfer. As of this writing, all the interested sovereign states (Egypt, Israel and Saudi Arabia) have consented to the transfer, but it may be held up in Egyptian courts and parliamentary debates. The actual ownership of the two islands is not clear. Between WWI and 1967 Egypt controlled them. Israel conquered them in 1967, and returned them to Egypt in 1982. However Saudi Arabia has claimed ownership all the time. As part of an agreement to build a causeway that will connect Egypt and Saudi Arabia, Egypt ceded or returned the islands, depending on the different interpretations. My proposal has to be considered with a grain of salt, and is earlier than TheHonRose's answer. That said, given the consequences it has had lately, I am a little surprised that nobody has written about transfer of Crimea from the Russian Soviet Federative Socialist Republic to the Ukranian Soviet Socialist Republic, in 1954. The SU was a Federation. The RSFSR agreed to the change. The Ukranian SSR was an independent subject of international law to a certain extent (to the point of getting an independent membership to the UN). And of course, I doubt that the people doing the transfer thought at the time that they were "giving" anything but simply doing an administrative reorganization (with the end result that Crimea was managed from Moscow through Kyiv instead of being directly managed from Moscow), but from a legal point it does not matter. As stated before, this answer comes with a lot of caveats, but I think it is worth mentioning it due to the size of the land transfer. The areas occupied by American and Canadian military cemeteries in Normandy were voluntarily conceded by France to the respective ally in 1944 as a gesture of gratitude. Of those, the Brittany American Cemetery and Memorial is the most recent for which establishment I can find a full date, which is 1944-08-04. 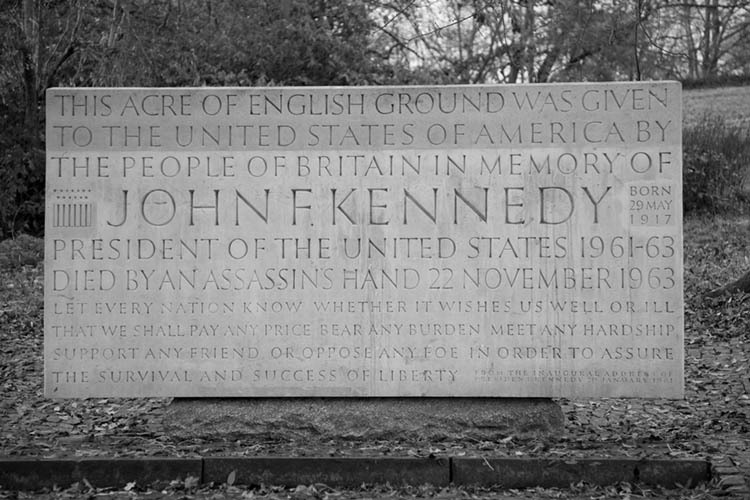 The area of the The John F Kennedy Memorial at Runnymede, site of the signing of Magna Carta, was gifted to the USA in 1965. Whilst the surrounding gardens are British sovereign territory, the land is owned by the US Federal Government, and the site of the actual memorial is US sovereign territory. In 2007, Israel gave Gaza to the Palestinian Authority, in an (evidently unsuccessful) effort to reduce tensions. Since the OP doesn't state that the recipient must be a nation, only that it must still exist, we needn't enter the debate on whether the PA is a nation for the purposes of answering this question. The OP may need to clarify whether this transfer meets his intended meaning of "friendly," but it was certainly voluntary, coming as it did as a surprise to almost everyone. I'm not sure if this counts, but the Netherlands and Belgium traded a small part of land a while ago. The reason for the trade was that the piece of land was officially part of Belgium, but it was situated directly adjacent to the Netherlands while separated from the rest of Belgium by a river. For this reason, they traded it with another piece of land. Source for this: Limburg en België ruilen stukjes land (only in Dutch unfortunately). In late 1994 or 1995 Israel gave a small strip of farm land to Jordan after the signing of the Israel-Jordan peace treaty. This land was not part of the treaty but as it was east of the river (and I believe conquered in 1967 along with the West Bank) it was given as a token to the Kingdom. Yesterday (2016-09-21) Slovak republic approved a constitutional law changing the border with Hungary. However, it's a territory swap, and while voluntary, it's based more on convenience (changing river basin) than generosity and friendship. In 1994 South Africa transfered the enclave Walfis Bay and some offshore islands to the Republic of Namibia. Walfis Bay is the largest port and one of only two natural ports on the Namibian coast, so it was quite a significant act for Namibia. On the first of march in 1952 Heligoland was given back to Germany by the United Kingdom after it has been used as a target for Air Force bombardment training after the second world war. A corner case: In 1921 Germany ceded a large part of southern Jutland to Denmark. This was not really voluntary on part of the Germans, since the Treaty of Versailles ordered a plebiscite to adjust the border. (On the other hand, when Germany invaded and occupied Denmark just 19 years later, they made no attempt to reintegrate this area into the Reich, despite the Nazi leadership's general disdain for Versailles and otherwise aggressive territorial ambitions, so the loss cannot have been very deeply mourned). But from the Danish end it certainly looked like a free gift -- Denmark had remained neutral through WWI and was not a party to the Treaty of Versailles, and the plebiscite covered only areas that were German prior to the war, so there was not even a theoretical possibility of Denmark losing territory in the transaction. It could be argued that WWI belligerents together gave northern Schleswig to Denmark for no consideration. On September 20, 1979, the US signed a treaty with Kiribati abandoning its claims on several islands ("Canton (Kanton), Enderbury, Hull (Orona), Birnie, Gardner (Nikumaroro), Phoenix (Rawaki), Sydney (Manra), McKean, Christmas (Kiritimati), Caroline, Starbuck, Malden, Flint, and Vostok"). It appears that sovereignty over the islands was disputed, but the treaty clearly had a similar effect to an outright gift of undisputed territory. It also is pretty clear that the USA could have retained the islands by force if it had wanted to, so this wasn't a case of surrendering territory under serious threat of conquest. I am not sure this counts as a "gift", but one option to consider is Pheasant Island, an island in the Bidasoa river at the border between Spain and France. It is a peculiar case of a condominium, in which France and Spain do not share the sovereignty, but instead alternate it in periods of 6 months. Each year, France officially exercises sovereignty over the island from August to January, while Spain does from February to July (link in French). Therefore, the last change (to date) was on 1st August 2016, when Spain transferred sovereignty over the island to France (the next one will be on 1st February 2017, from France to Spain, and so on). This is definitely a "friendly" transfer, but I am not sure you would count it as "voluntary", as it follows from an international treaty (Treaty of the Pyrenees of 1659 and Treaty of Bayonne of 1856). If you allow swaps, there's the recent (much delayed!) case of the Cooch Behar enclaves: 162 small patches transferred. Also Verenahof, a former German exclave (529 912 m²; I don't know what that is in football pitches) transferred to Switzerland in 1967 in exchange for a similar area of land. When Britain pulled out of Aden, which became South Yemen in 1967, it voluntarily returned to Oman the Kuria Muria Islands, which were off the Omani coast and had been governed from Aden. I'm sure not what you're looking for, but as a technicality: The property of an embassy is normally considered the sovereign territory of the country staffing the embassy, and not of the host country. So any time a new embassy opens, the host country is donating some land to the foreign country. North Korea opened an embassy in Belarus on Sept 18, 2016, so that's probably the most recent such case. Okay, this looks like a word game. Of course, diplomacy is often all about word games. Under the Vienna Convention on Diplomatic Relations (http://legal.un.org/ilc/texts/instruments/english/conventions/9_1_1961.pdf), Article 22, "The premises of the mission shall be inviolable. The agents of the receiving State may not enter them, except with the consent of the head of the mission. ... 3.The premises of the mission, their furnishings and other property thereon and the means of transport of the mission shall be immune from search, requisition, attachment or execution." And Article 23, "The sending State and the head of the mission shall be exempt from all national, regional or municipal dues and taxes in respect of the premises of the mission ..."
The Vienna Convention does not use the words "soveriegn territory" or any similar phrase, either to say embassy premises are the territory of the host or the sender. So ... the embassy property is the territory of the host country, but they cannot enforce their laws there nor collect taxes there, and an attack on embassy property is considered an attack on the sending country. And by the way, embassy grounds are normally patrolled by soldiers or other armed personnel of the sending country. It sounds to me like a very fine hair to split, to say that the sending country sets and enforces the laws, has sole right to impose taxes, and maintains troops on this piece of land ... but it's not their land: the land belongs to another country that does NOT set or enforce any laws, impose any taxes, and is not allowed to send troops in. In a brief web search I found plenty of sources saying an embassy is the territory of the host and plenty saying it's the territory of the sending nation. e.g. host: https://www.aleksandreia.com/2012/10/29/why-american-embassies-are-foreign-territory/; sender: http://www.lawndalenews.com/2012/08/embassy-sovereignty-is-sovereignty/; some of each: https://uk.answers.yahoo.com/question/index?qid=20070110055033AArqDLB. Not the answer you're looking for? Browse other questions tagged political-history international-relations modern or ask your own question. Were there occasions when a sovereign country voluntarily joined another country? Has a foreign power ever sought to compel another country to abide by international law by means of that country's internal judiciary? What are the earliest examples in history where one state/people stepped in to rescue another? Has the USA offered aid to every sovereign nation? Has any country ever 'sold' a part of it's territory voluntarily to another? Has any country won a war, but lost a non-trivial portion of its territory? Was Catalonia ever a sovereign state? Has there ever been a US election that flipped as many state seats as the 2010 midterm elections? When was the first known international call between two heads of state or government?